Fleas have increasingly become a problem within residences of all kinds, including homes, apartments, hotels, cruise ships, dormitories and shelters. We have developed these web pages to provide basic information about the biology and health significance of these pests, and to offer guidance on how to safely and effectively manage an infested residence or dwelling. IdentifyUS is an independently owned and operated entity focused on bringing you objective, expert advice in a timely fashion. You can help us maintain this effort with a thoughtful contribution. Flea is a common name for insects of the order Siphonaptera. These are wingless insects with mouthparts designed for piercing skin and sucking the blood of mammals (including bats and humans) and birds. 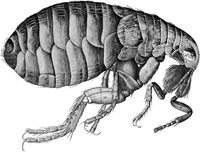 Fleas are external parasites.